Virginia Peraza was born May 7th 1972 in Havana City. She has been the keyboard player for Anima Mundi since the very beginning of the band. Since she was a child she showed interest for music and painting. While a teenager she was already a fan of classical music and expressed her desire to go to the music school and major in music professor and piano. This dream came true when she entered the Instituto Superior Pedagógico Enrique José Varona (ISPEJV) and majored in Musical Education with the specialty of piano in 1995. There she met Roberto Díaz who had also attended the same school and then they planned to found a progressive rock band. Virginia decided to be a member of Anima Mundi from the very far beginning in 1996 mostly because she was attracted by symphonic and progressive music and the idea of playing in a formation in the same vein of bands such as her favorite favorites King Crimson, Yes and Pink Floyd. Her musical career goes tightly linked to the Anima Mundi work. She has been present in the whole story of the band not only in the studio but also live. She has also done sound engineering work for the albums Jagannath Orbit (2008), The Way (2010), Live in Europe (2012), The Lamplighter (2013), I Me Myself (2016) and Septentrión (10th Anniversary Remastered Edition). 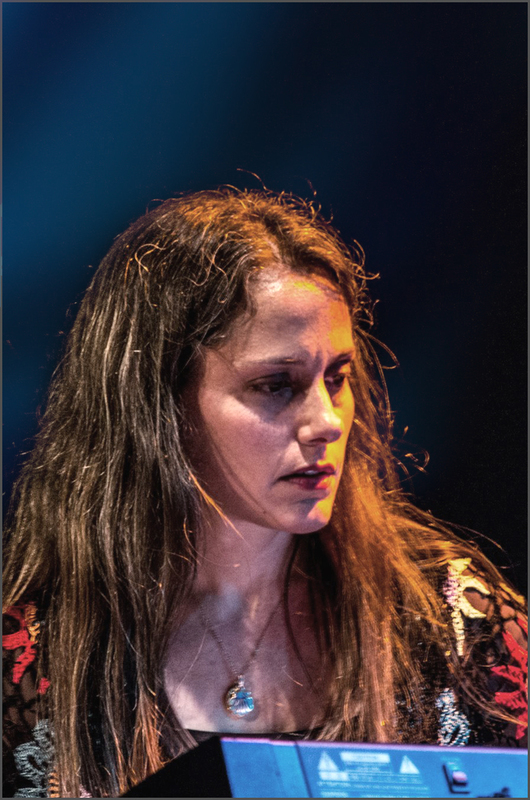 As a keyboard player she has collaborated with other musicians or projects among them: Raúl Ciro, albums Ciro 3C (1998) and Queso (1999), Miguel Ulises, album Trampas de la Belleza (1999), Tesis de Menta, two first demos cds plus live (2004-2005), Los Kents, live (2006-2008), Vieja Escuela, live (2015-2017). Occasionally, she has shared stages and recordings sessions with other artists and bands. Virginia has done a remarkable work as a graphic designer for Anima Mundi website, promotions, banners and some of best Anima Mundi albums’ artworks such as: The Way, Jagannath Orbit, Septentrión (remastered edition), DVD and CD Live in Europe and collateral project Nimbo EP Sobre las Brumas. In this whole bunch of collateral jobs, Nimbo, which is an Anima Mundi’s side project, is the one to be highlighted in Virginias’s career. Inside Nimbo, integrated by the composer and leader Anaisy Gómez on clarinet, bagpipe recorder and tin whistle, Roberto Díaz on guitars and she on keyboards, programming, accordion and vocals, Virginia contributed a lot in the arrangements, creative ideas and sound engineering. Nimbo reflected the Celtic airs that Anima Mundi had once, principally shown in the album Septentrión. However, Virginia also witnessed the bend that Anima Mundi took towards a balanced mix of Celtic, symphonic rock and new age music achieve a faithful audience in Cuba. She is also composer and producer of music for television; to be mentioned: Guanhacabibes, La Noche de los Libros, Coordenadas, Secuencias, Dando la Nota, Noticiero Buenos Días and Noticiero de Cine Latinoamericano. Virginia is well known for her unique approach to the keyboards atmospheres filled with colors. To achieve this, she uses different synthesizers and vintage keys such as: Mellotron, Hammond, Farfisa, Pipe organ, Rodhes, Wulitzer and Moog and with her very own symphonic sounds, using tunes created by herself like the powerful opening orchestra as long as reverbed and delayed layers mixed with strings, wood wings and synths effects as one. Her sensibility for composition, arrangements and orchestrations as well as her contribution in sound engineering, have been indispensable piece in Anima Mundi sound and history.